This week the New England Journal of Medicine (NEJM) published an article by researchers from Wisconsin who evaluated sensor technology to assess clinical skills. They sought to understand if a force sensor could provide insight for the performance of clinical breast examination (CBE). They recruited 553 physicians – breast surgeons, family doctors and gynaecologists – at their annual congresses and tested them using four models of the breast. 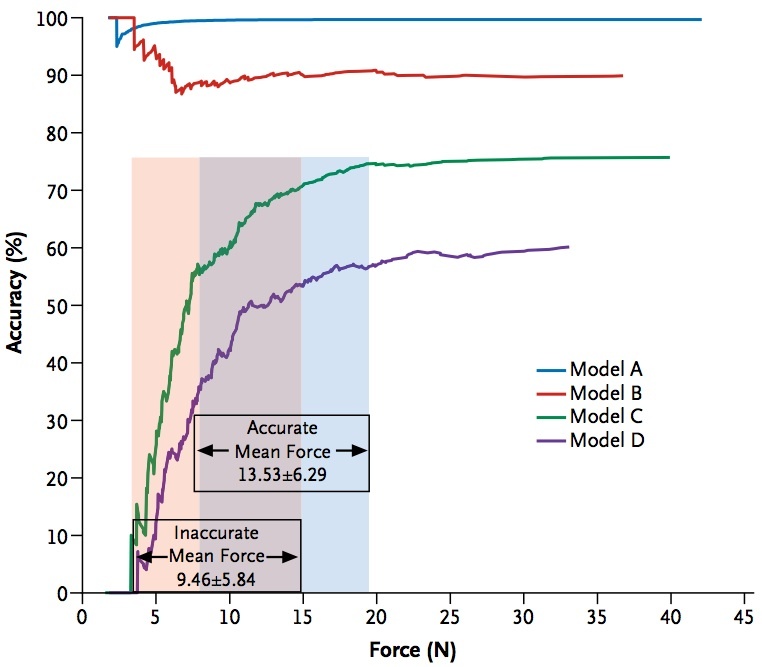 Each model employed a sensor to measure applied force and incorporated an embedded mass to simulate breast lesions, two superficial and two deep. Dr Frank Hoffmann is a gynaeclogist based in Duisburg, Germany who had a eureka moment while standing in his shower: Could a blind woman do a better job than him in identifying breast cancer when conducting a CBE? The idea that blind people might detect tumours earlier than their sighted counterparts had in fact been around for a few years, but Hoffman took the initiative to explore the idea further. He established an organisation, Discovering Hands, and devised a course to train blind women to become Medical Tactile Examiners (MTEs). Although Gerd Gigerenzer of the Max Planck Institute is skeptical about the benefits, one of Hoffmann’s patients says she owes her life to the MTE who diagnosed a small lump, just 2 mm in size that did not show up on either X-ray or ultrasound. Meanwhile, Discovering Hands is now looking to expand into Austria, Israel and Columbia. 2. Stiffness of the tissue and the difference in stiffness between normal tissue and tumour. A test with potentially a lot of noise, but not worse than mammography in Canada 1980 (Miller BMJ)! It puts “symptomatic “and “non-symptomatic” in perspective. Almost every tumour is more stiff and for that reason symptomatic, if you can come close enough.